Patients with an IgE-mediated Hymenoptera allergy will typically present with systemic symptoms (described below) that begin within minutes of the sting. Small, local reactions following a sting are common and are a normal response. What are the typical symptoms of Hymenoptera allergy? Reactions following insect stings include local, large local, and systemic allergic reactions. Local reactions are associated with pain, swelling, and erythema at the sting site, but do not extend beyond a small, localized area. This type of reaction typically resolves within 1-2 hours and is a normal response to the insect venom. Large local reactions (LLRs) are characterized by pain, swelling, and erythema at the site of the sting but may extend to a larger area. Patients also may experience nausea and/or vomiting. LLR susually peak at 48 hours after the sting and can last as long as 1 week. In general, patients who experience a LLR will have a similar reaction upon re-sting and are not predisposed to systemic allergic reactions. Systemic allergic reactions (SARs)affect more than one organ system with the skin, gastrointestinal, respiratory, and/or cardiovascular systems most commonly affected. This type of reaction can be life-threatening and should lead to prompt medical treatment. There is typically no warning that a SAR will occur following a sting. Localized reactions can also be caused by a variety of insects, e.g., spiders, however, there is rarely immediate pain associated with the bite compared to that associated with Hymenoptera insects (bees, wasps, yellow jackets, hornets, and fire ants). Bites from other insects do not typically lead to SARs, although poisonous spiders, such as the brown recluse (Loxosceles reclusa) or black widow (Latrodectus spp. ), may cause systemic symptoms secondary to the venom toxicity. Identification of the specific insect associated with a sting reaction is important but can be difficult. For example, many members of the Vespidae family have similar coloring and body types. Knowing the locale of the sting and the type of nest also can be helpful. Yellow jackets typically nest in the ground and can be encountered during yard work, farming, or gardening. Hornets create large nests in trees or shrubs. Paper wasps create honeycomb nests that can be found in shrubs or under the eaves of buildings. Honeybees are most commonly found in commercial hives but can also nest in tree hollows or old logs. Yellow jackets, hornets, and paper wasps are scavengers that can be found around discarded food and are typically aggressive in nature. Honeybees are not typically aggressive but are territorial and may become aggressive to protect their hive. Stings by honeybees are typically characterized by a barbed stinger that is left behind in the tissue. Fire ants are red or black in color and build large mounds. They are very aggressive and will typically sting multiple times, creating a sterile pustule at the site of each sting that aids in identification. Most patients that present following a Hymenoptera sting will experience a small, local reaction that does not require treatment. There are no existing parameters that predict which patients will have a SAR. In the USA, the risk of a SAR ranges from 0.5-3.3%. In children, the risk of a SAR is lower, ranging from 0.15-0.8%. Mortality from insect sting anaphylaxis ranges from 0.03-0.48 fatalities per 1,000,000 individuals per year or about 40 deaths per year. Patients with a history of a mast cell activation disorder (MCAD), including systemic mastocytosis (SM), mast cell activation syndrome (MCAS), or monoclonal mast cell activation syndrome (MMAS), are at increased risk of a life-threatening SAR. For patients presenting with a recent history of an insect sting and concern for Hymenoptera allergy, there are a few laboratory tests that are helpful to confirm the diagnosis of Hymenoptera allergy. An elevated total serum tryptase level obtained at the time of the reaction can confirm that a SAR most likely occurred. Tryptase levels peak 1-2 hours after a sting-induced SAR and have a half-life of approximately 2 hours; thus serum tryptase must be drawn within this time frame to be useful. Patients should be treated for their reaction, as indicated, and referred to an allergist/immunologist for further evaluation. Evaluation of Hymenoptera allergy begins with a history of the inciting sting and subsequent reaction. If an IgE-mediated allergy to Hymenoptera is suspected, skin testing is performed to confirm sensitivity to the insect. If the skin test is negative and the history of SAR is convincing, serum venom-specific IgE-testing should also be performed. Ten to twenty percent of history-positive patients with negative skin tests will have positive serum venom-specific IgE. Likewise, approximately 10% of patients with negative serum venom-specific IgE test have a positive skin test. Whole body extract (WBE), which contains the venom allergens, is utilized to testfor imported fire ant sensitivity. Imaging is not helpful to diagnose Hymenoptera allergy. 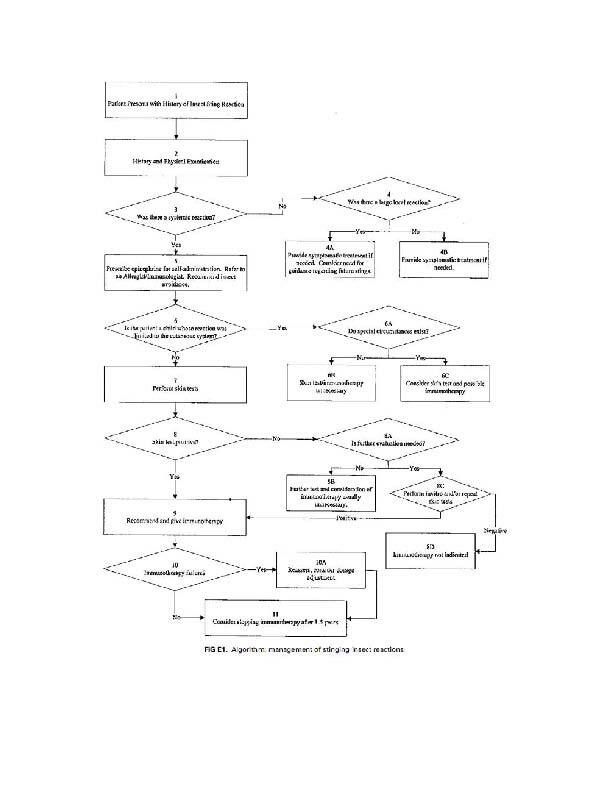 See Figure 1 – ‘Algorithm for the Management of Insect Sting Reactions’. Evidence for skin testing in case of suspected Hymenoptera allergy is category A (evidence based upon at least one controlled trial). Skin testing should be initiated before in vitro testing (category C, based upon comparative studies or extrapolated from controlled trials). The use of venom immunotherapy (VIT) for those patients found to have an IgE-mediated allergy to Hymenoptera is category A, except for children younger than 16 with only cutaneous reactions (category D) or for adults with large local reactions (category B, based upon at least one non-randomized, controlled trial or extrapolated from a randomized, controlled study). Venom immunotherapy should be continued for 3-5 years (category C), but may be continued longer in patients with life-threatening SARs, MCADs, elevated baseline serum tryptase levels (category B), or to maintain normal quality of life (category A). The immediate treatment of insect stings depends on the reaction. Most local reactions require no treatment. LLRs can be treated with cold packs, elevation of the affected extremity, and oral H1 antihistamines. Severe or multiple large local reactions can be treated with oral corticosteroids, e.g., prednisone 1 mg/kg/day in divided doses for up to 5 days. For treatment of SARs, epinephrine is the drug of choice. Doses range from 0.01 mg/kg (up to 0.3 mg) in children to 0.3-0.5 mg in adults. Oral H1 and H2 antihistamines can also be utilized and may provide additional benefit but should not be used in place of epinephrine. For patients with hypotension, epinephrine is the drug of choice. However, fluid resuscitation may be required if epinephrine alone does not restore blood pressure and adequate tissue perfusion. Bronchospasm is best treated with inhaled beta-agonists and oxygen if not reversed with epinephrine. For those patients on beta-receptor blockers not responding to epinephrine administration, glucagon, 1-5 mg given slowly intravenously, may help restore the normal blood pressure. Glucagon relaxes smooth muscle and functions independent of the beta receptor. Corticosteroids will not reverse the acute symptoms of a SAR due to their delayed onset of action (1-2 hours after administration), but may play a role to prevent a late-phase reaction if given shortly after the acute reaction begins. Epinephrine containing syringes such as Epi-Pen® (Mylan Specialty, Pennsylvania, USA) are available for patients to use for self-administration. They should be used immediately after a sting in a patient with a known history of IgE-mediated allergy to a Hymenoptera insect. These devices do not serve as a replacement for medical care and the patient should seek immediate medical attention if used. Patients with a history of a SAR following a Hymenoptera insect sting, with positive venom skin testing or venom-specific IgE antibodies, should receive VIT. The goals of VIT are to prevent future SARs and to alleviate concerns about future stings. Once a patient reaches maintenance dosing, VIT can prevent SARs in 75-95% of patients who are re-stung. The effects of therapy are long lasting and 80-90% of patients who receive 3-5 years of therapy will not experience a SAR after re-sting. Insect-sting reactions that occur while on VIT are usually mild. Disadvantages of VIT include the amount of time required to reach the maintenance dose and potential adverse reactions. The initial buildup phase requires injections on a weekly or bi-weekly basis until a maintenance dose is reached, typically in several months. Dosingis increased to every 6 weeks after 1 year of treatment and continued until the end of therapy. There are rush and ultrarush protocols that decrease the time interval to reach maintenance. By using such a protocol, patients can reach maintenance within hours or days, although the risk of an adverse reaction associated with these protocols is higher than standard therapy. The majority of patients require 3-5 years of therapy but some, such as those with MCADs, may require life-long therapy. Patients may experience adverse reactions while receiving VIT and the majority of these are either local reactions or LLRs. Approximately 6-30% of patients will experience a SAR. Factors which increase this risk include female gender, use of honey bee or yellow jacket venoms, and an elevated baseline serum tryptase or a history of a MCAD. VIT is indicated for any patient with a history of a sting-induced SAR with evidence of Hymenoptera sensitivity except for those ages 16 or under that have only cutaneous manifestations (urticaria, angioedema, and flushing/itching) of a SAR. Less than 10% of children with such reactions will have a SAR upon re-sting and most will not be serious. Less than 1% will experience a life-threatening SAR. One exception may be children living in areas of endemic fire ant exposure, where WBE immunotherapy is indicated for all SARs, including those limited to the skin. VIT for bee, wasp, yellow jacket, and hornet and WBE for fire ant is not recommended to treat LLRs unless the LLRs are debilitating and appreciably decrease the quality of life. Adverse effects associated with epinephrine include nausea, tremor, a bounding pulse, palpitations, and headache. Second generation H1 and H2 antihistamines are rarely associated with any significant side-effects. Short-term glucocorticoids are generally well-tolerated but can cause agitation, insomnia, increased appetite, and other side-effects. Adverse reactions associated with VIT include pain, swelling, redness, and pruritus at the site of the injection. LLRs may also occur. Approximately 6-30% of patients experience a SAR during VIT. There was no increased risk to the fetus or mother in a study of 26 pregnant women, including 43 pregnancies, treated with VIT. Because of potential risk, pregnant women should not begin VIT unless the risk-benefit for doing so is justifiable. Those already on maintenance therapy can continue, but the dose and time interval between doses should be decreased by half to reduce the chances of inducing a SAR. Outcomes following an insect sting depend on the type of reaction. Less than 5% of adults who experience a local reaction or LLR following the initial sting will have a SAR upon re-sting. For patients who experience a sting-induced SAR, 40-60% will have a SAR with a future sting. In children who experience a SAR limited to the skin, less than 10% will experience another cutaneous SAR upon re-sting with less than 1% experiencing a life-threatening SAR. Families and patients should be educated about the different kinds of Hymenoptera insects and environments in which they exist to decrease the chance of future exposure. They should also be counseled on the benefits of VIT and its effectiveness in preventing future SARs. Allergy to Hymenoptera is due to the generation of venom-specific IgE antibodies against proteins found in Hymenoptera venoms. Th2 T cells drive the production of IgE-producing B cells that disperse the venom-specific antibodies throughout tissues. When a patient is stung by an insect to which he/she is allergic, the venom is recognized by the IgE antibodies. The antigen-antibody complexes bind to receptors on mast cells and basophils causing the release of preformed mediators such as histamine and tryptase and the generation of newly formed mediators including prostaglandins, leukotrienes, and cytokines. These mediators promote allergic inflammation in various tissues leading to the clinical symptoms associated with a SAR. In the United States, sting-induced SARs occur in 0.5-3.3% of the general population. The rate is lower in children at 0.15-0.8%. Most SARs occur in patients under the age of 20 with a male:female ratio of 2:1. Complications of Hymenoptera allergy include SARs and even death. Complications from treatment include a local reaction, LLR, and a risk of a SAR. No fatalities have been reported with immunotherapy for Hymenoptera insects. Skin testing and in vitro IgE antibody assays are the mainstay for diagnosing Hymenoptera allergy. There are several tests that are available in research laboratories not available to clinicians. One such test is the basophil activation test. Basophils are collected from a patient’s blood and, when challenged with venom, activate and release chemical mediators through the process of degranulation. Flow cytometry is used to measure cell surface molecules, such as CD63 and CD203, which increase during basophil activation. Venom-specific IgG antibodies can also be measured but are not useful in diagnosing Hymenoptera allergy. When elevated, venom-specific IgG antibodies may indicate tolerance to Hymenoptera venom proteins. Sting challenges may also beused to test for clinical sensitivity. During a sting challenge, the patient is stung by the culprit insect to determine if a SAR occurs. Even though sting challenges are the gold standard, they are rarely used because of the difficulty of doing so. Controversy also exists regarding the interpretation of sting challenge results and the ability to predict a reaction following a “field” sting as there may be differences based upon the type of insect used during the challenge. For example, bee stings deliver more consistent amounts of venom than do vespids, thus reducing the usefulness of this test in a clinical setting. Avoidance of stinging insects is the best preventative measure. Understanding the nesting and behavior patterns of Hymenoptera insects is very helpful. For example, honeybees are protective of their hives, but are not typically aggressive. Wasps and hornets are attracted to food and garbage and are naturally aggressive. Removal of nests by a professional entomologist is the best option. Insect repellants are useful to prevent bites by insects such as mosquitoes but are useless to prevent Hymenoptera stings. It also helps not to go barefoot when outdoors to prevent exposure to Hymenoptera insects that forage on the ground, particularly fire ants. There is some controversy over the use of VIT to treat LLRs as well as controversy regarding the treatment of cutaneous reactions limited to the skin in adults. Evidence suggests that the use of VIT in these latter patients improves quality of life. There is also controversy over the use of epinephrine-containing syringes in patients who have achieved VIT maintenance. Decisions to carry these devices may depend on the type of reaction as well as the age and the quality of life of the patient on such therapy.